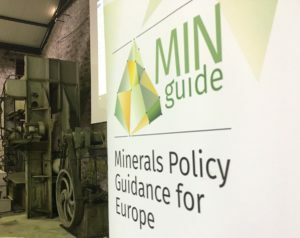 The MIN-GUIDE project addresses the need for a secure and sustainable supply of minerals in the European Union by developing a Minerals Policy Guide. The Guide contains information about mineral and related policies, as well as governance at the Member State and EU level. The 4th Policy Laboratory Workshop, entitled “Innovations and Supporting Policies for Waste Management and Mine Closure”, aims to provide an overview of, and reflect upon, innovation examples in Waste Management and Mine Closure, including tailings management, waste water management and how they are linked to policy in the EU Member States. The Policy Laboratory format, designed by the MIN-GUIDE partners, engages participants from policy, industry, Geological Surveys, and research in an intensive and interactive exchange, which allows the participants to learn, hands-on, from good practice cases, to explore transferability in different contexts, and to reflect upon future policy needs. The outcome of the 4th Policy Laboratory will contribute to the further development of the Online Minerals Policy Guide. Participating in the Policy Lab 4 workshop of the MIN-GUIDE project and being part of the vivid discussions and knowledge exchange that take place, in.mat-Lab is willing to be an active SME in the circle of knowledge regarding waste management methods and practices.